I have a post in mind this morning that is a bit grumpy – so before I even go down that road, I’m going to share with you an artist who I discovered last year and whose work I am totally in love with. I’m thinking of her this morning especially because she just shared this link to a short video piece about her work which is worth a watch if you are into art processes. What I particularly appreciated about the video piece is that it gave confirmation to my suspicions the work of Shanna Trumbly – specifically, that each painting is a mini-story. I’ve always envisioned her pieces as fairytale fragments and been drawn into them through my own internal story-telling impulses. In turns whimsical and wistful, each canvas depicts a chapter from the secret lives of plants and animals – their magic, passions, and heatbreaks experienced far from human eyes. Reminiscent of a children’s picture book, but more meticulously drawn – Shanna successfully transforms simple illustration into a much deeper artistic vision. 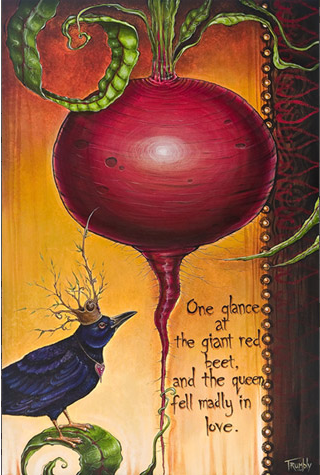 Really, I’m no art critic, but the moment I saw the painting above in Trumbly’s Etsy shop – “The Queen and The Beet” – I wanted a print of it for our backyard studio. Not only because it features a crow (endemic to East Vancouver! ), and not only because my nickname for Brian is “Beet” – making it the perfect romantical gift – but because it somehow is so evocative of the earth/garden love that I want to infuse our home all the time. As are all her works…. deeply loving of the natural world. Best thing about her shop? Even if you can’t afford her large Giclee prints (which I would love, but priced around $500 are not in our range), she sells fabric patches for $10 and Eco Paper Prints for $20. Having bought an Eco Paper print last year, I can attest that these are high-quality prints which have a great colour range and brilliancy. I really would encourage you to go check out her website, or poke around the Etsy shop the next time you are thinking about gifts or some art for your walls. Personally, I’m thinking fabric patches are definitely in order the next time I’m sewing up a special bag or pillow.